This cozy cottage is nestled among the trees on a quiet walking street. This lovingly restored cottage has all the creature comforts and you can't believe the porch! 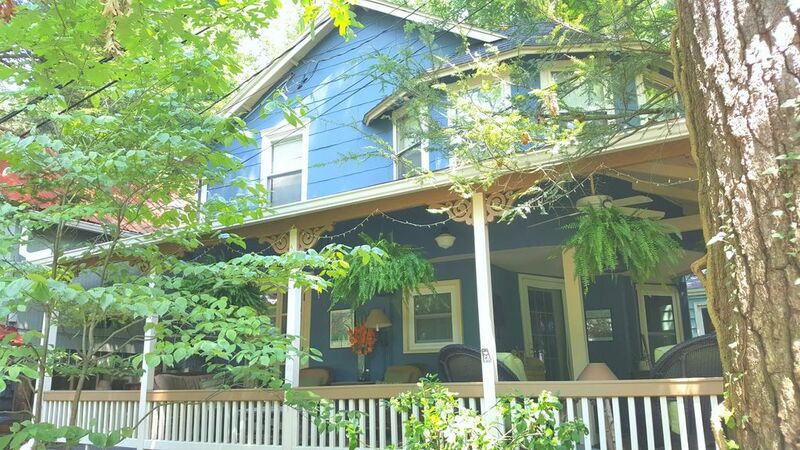 This cottage offers a gourmet kitchen with new stainless steel appliances, granite counter tops, and island for plenty of work space, 3 spacious bedrooms, one and a half baths, central heat and air, and did I mention the porch ? This wrap around porch offers plenty of seating and a quiet setting nestled among the trees. There is also off street parking a short walk from the cottage. If your looking for peace and quiet, this is the cottage. Relax on the porch will taking in the view of the trees and the smell of the pines. Come enjoy all that Mt Gretna has to offer! Mt Gretna playhouse offers theater productions, musical events, and children's theater. The Mt Gretna lake is within walking distance and offers a beach area, play area and canoe rental. Hiking and biking trails are near by, as well is the Rail Trail. Numerous festivals and programs provide entertainment all summer long. Penn Realty, Ltd. is a professional, full time real estate agency that has been providing property management in Mt Gretna and surrounding areas for over 25 years. The house was just as the pictures showed. It was neat and clean and very homey. Loved the porch. We would stay again. We loved our stay, especially the beautiful wraparound porch! 1. Stove top turned on and could only be shut off using breaker. 2. Outside trash containers not marked with address. Recycle was empty however trash can was full and nasty..
3. Arrived to a broken screen door. There was a note. Had these three been taken care of I would have easily given it 5.. Everything else was GREAT!! I would go back.. only after stove is fixed. That is dangerous. We are glad you enjoyed this wonderful area. All of the issues you mentioned have been addressed and we hope you will return. The updated kitchen and bathrooms are a very nice touch for this place. Being on a walking only trail made reading a book in the morning very pleasurable. This is a place I will certainly be returning to. We had a great time staying here. The porch is absolutely fantastic. The kitchen looks amazing, the updates are great. Cottage was very cute & quaint, as were the surrounding cottages, & all are very close together FYI. This place was very clean & we were all very happy. Highly recommend.